To find more friends on Facebook, you can do a search for them or have the service go through your contacts on other communication platforms like your email account (e.g. Gmail) or instant messaging client (e.g. ICQ). One of the options is to log on to Skype and have your contact list cross-checked with Facebook’s vast database of identifiable users. 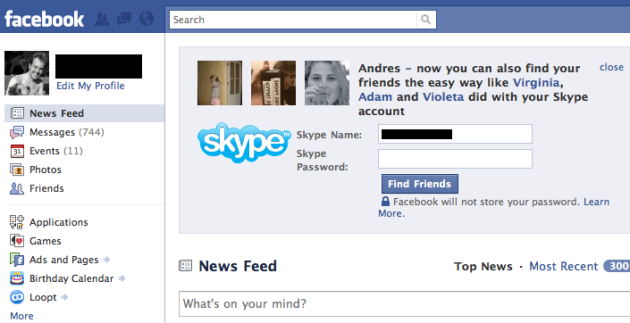 Some time this morning, Facebook started actively prompting users on their homepage, up on top, to connect to Skype and to discover more friends. As you can tell from the screenshot above, sent in by an eagly-eyed reader, Facebook even makes things easy for you by already filling in your Skype handle (not to panic, that means you shared it on your profile page). Upon refresh, our tipster didn’t see the dialog box anymore even though he did not log in to Skype, so it seems like Facebook is randomly pinging a subset of users to share their Skype contact details and expand their social graph on the network. I did a quick search for other reports on this and haven’t been able to find anything on blogs and news sites, so I’m assuming this is new. As far as I can tell, people only started talking about seeing the message appear on top of their Facebook homepage on Twitter since this morning. Update: Ouriel Ohayon spotted it about a week ago. One user took another screenshot, and others are just diligently sharing that they’re seeing something that wasn’t there before. We’ve asked both Facebook and Skype for more guidance.